Give your child hours of playtime fun with one of these top-rated train sets. 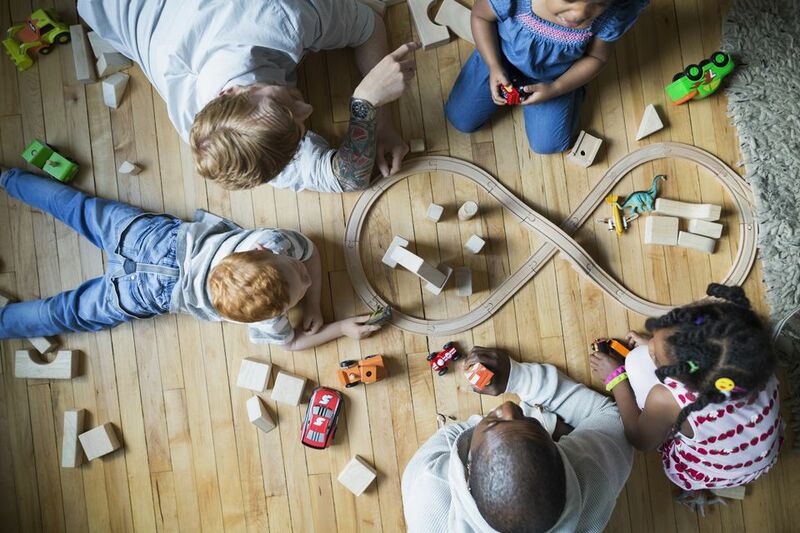 Brio is known for its well-made, creative toys, and this wooden train set is no exception. It’s perfect for kids just getting on board with train adventures. This starter pack comes with a brightly colored train, a bridge, ​ramps and tracks. The parts, which are made of solid wood, are easy to put together and take apart so they can experiment and design all sorts of routes. It’s also compatible with all of the other Brio train sets, so you can expand their collection over time for limitless possibilities. Recommended for kids ages 18 months and up, it’s a great a way to encourage creative play and can help kids develop hand-eye coordination. And of course, most importantly, it’s just fun. This train set comes with everything kids need to get their train game on, including the table. There are 100 pieces including train tracks and three trains. The fun doesn’t stop there, however, as this set provides a brightly painted landscape that sets the scene as well as fun features like an airport with a runway, a helipad and a hospital with an ambulance. There are animals, trees, bridges, additional vehicles and more for tons of imaginative adventures. Two storage bins underneath provide a place for the pieces not being used. The set is compatible with Thomas and Friends and Brio wooden train sets as well for even more for fun. Recommended for ages three and up, this train set is built for years of use. This cute train set can get kids’ learning on track while they play. Not only is it a great train set with tracks, an electronic train station, a bridge, tunnel and more, but it will also teach them important skills on their journey. From letter sounds ("‘T’ is for train") to colors and time and even phrases in foreign languages, they’ll be learning as they roll the train over SmartPoint locations. Additional vehicles can be purchased separately, and each elicits a different response to the SmartPoints. Three required A batteries are included. Bright, colorful and fun, this train set is recommended for kids who are one and older. From the time they can push the little cars, they can get on board for the fun. This train is a bit of investment, but if you’re looking for some serious track action, this may be just right. Recommended for kids age 14 and up, it’s not one for little fingers. Older kids, however, will delight in the details and abilities of this train set. It features an engine, a three-dome tank car, a boxcar and a caboose with realistic details such as opening doors and metal handrails, as well as enough track pieces to make a 40" x 50" oval. The train is operated with a battery-powered remote (three AAA batteries are not included) that can power it backward and forward and control whistle and bell sounds, steam chuffing and special announcements too. If your little engineer prefers to think pink when it comes to toys, this wooden fairy town train set will be a hit. Pretty and pastel, this one stands out among traditional train sets that are typically decked out in dark or primary colors (much too boring for fancy fairies). The set comes with 75 pieces for tons of building fun. Included is everything from a pink bridge to pastel trees, houses and even a helipad, because not everyone is lucky enough to fly like fairies. And, of course, there are fairies included as well. It has everything they need to build a beautiful, whimsical world in which to embark on plenty of magical journeys. Recommended for ages three to eight, it’s compatible with most other wooden train sets for expanded adventures as well. This Lego train set combines two childhood favorites into one fun toy that lets them build their own motorized train brick by brick. Included is everything they need to build a cargo train, including a crane to help lift and lower the cargo as well as an eight-channel, seven-speed infrared remote control to send it rolling down the tracks. Other pieces include a full circular track with 30 curved rail tracks and eight straight ones, and accessories like a cow (for the cattle wagon), a bucket of milk and train station complete with an office that has a computer, cup, trash can and fire extinguisher. Four minifigures are included as well — a forklift driver, train driver, farmer and truck driver — to drive the creative play. In all, there are 888 pieces, which can be combined with other Lego sets as well. The only limit to the journeys one which they can embark is their own imagination. There’s no better time of the year for a train than Christmas, and this Thomas the Tank Christmas Freight Train set will help you celebrate in style whether it’s December or any other month of the year. It comes with a Thomas the Tank Engine who sports a removable Santa cap. There’s also a wagon car and a caboose, as well as trees, presents and tracks on which the train can travel. It’s all controlled by a remote that lets you move the train forward and backward and sound bells, whistles and special announcements. Note: The remote requires three AAA batteries, which aren’t included. It’s recommended for kids ages 14 and up, so it’s definitely not one for little ones to play with, but for train-loving older kids and even adults, this is one fascinating train set that will set a festive tone to keep the spirit of the season alive.